Situated in beautiful surroundings with unspoilt views of the Antrim Hills, the property is centrally located to various sandy and pebbly beaches 4 miles from bustling Bushmills. The famous Giant's Causeway and Carrick-A-Rede Rope Bridge and many other Northern Ireland tourist attractions are only a short drive away. The cottage which is attached to the owners home is light and airy and very tastefully furnished making it a great place to relax and enjoy the views after a satisfying day-out.Shop 3 miles. Pub. Restaurant 4 miles. Beach 4Ã‚Â½ miles. GF: lounge, kitchen/diner, double, shower room. FF: twin.Electricity and oil central heating included, linen and towels included, travel cot, TV, dvd player, radio, freezer, microwave, dishwasher, w/machine, welcome pack, partially enclosed garden, patio area, garden furniture, off road parking. Small pets welcome. 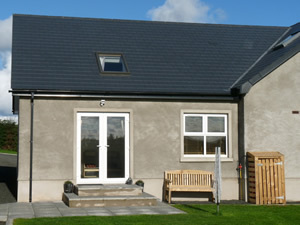 Bushmills is family friendly self catering.